On these December evenings, the constellation Cassiopeia the Queen appears high in the northeastern sky at nightfall and swings directly over Polaris, the North Star, at about 8 p.m. local clock time. Cassiopeia – sometimes called The Lady of the Chair – is famous for having the shape of a telltale W or M. You will find this configuration of stars as a starlit M whenever she is highest in the sky, hovering over the North Star. 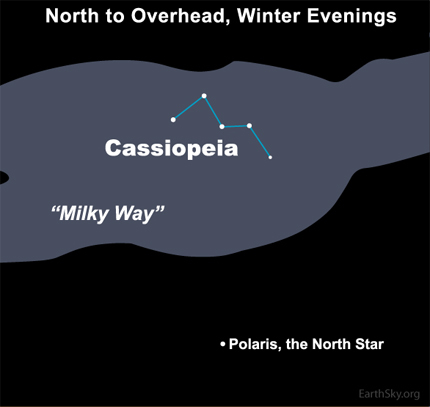 From a dark country sky, you will see that Cassiopeia sits atop of the luminous band of stars known as the Milky Way. Arching from horizon to horizon, this soft-glowing boulevard of stars represents an edgewise view into the flat disk of our own Milky Way galaxy. When Cassiopeia climbs above Polaris, the North Star, on these dark December evenings, note that this hazy belt of stars that we call the Milky Way extends through the Northern Cross in your western sky and past Orion the Hunter in your eastern sky. This winter Milky Way is fainter than the glorious broad band of the Milky Way we see in summer. 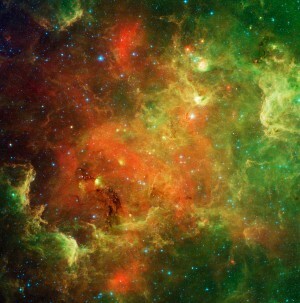 That is because in summer we are looking toward the star-rich center of the galaxy. In winter, we are looking toward the galaxy’s outer edge. By dawn, you will find Cassiopeia has swept down in the northwest – to a point below the North Star. At that time, if you are at southerly latitude, you might not be able to see Cassiopeia. The constellation might be below your horizon. But if you’re located at a latitude like those in the northern U.S., you will still see Cassiopeia sitting on or near your northern horizon.